As I write this, I’m looking out the front windows of Cowork Frederick watching a man hang a sign for a new business that’s opened across the street from us. The excitement that fills the air every time a new business opens - every time an entrepreneur "hangs a shingle" - is one of my favorite things about being part of Downtown Frederick. Cowork Frederick is fortunate to be located in a place where nearly every building is occupied by someone who had an idea and was brave enough to put that idea out into the world, to hang their own shingle and create something. Downtown Frederick is home to no less than 200 specialty shops, galleries, and restaurants. most of them are unique creations rather than franchise or chain stores. This is an entrepreneurial city. The location of our building in Downtown Frederick is great, but I consider myself even more fortunate to be surrounded by an amazing group of Coworkers who inspire me and challenge me daily to grow and be better - each of them an entrepreneur in their own right. There's Matt Johnston who wanted to break the mold in how law is typically practiced. Wayne Dorsey launched the Safe Ride Foundation. Bliss Spillar started a church. So did Shawn Coley. Kimba Green does social media marketing. Beth Conny coaches writers. Teddy Galloway helps young people create better lives. Derrick Miller does website design and digital marketing. Brett Talbot creates medical virtual reality applications, games & simulations. The list goes on. Each saw a different way of approaching their profession or an unmet need they could address in their own special way. 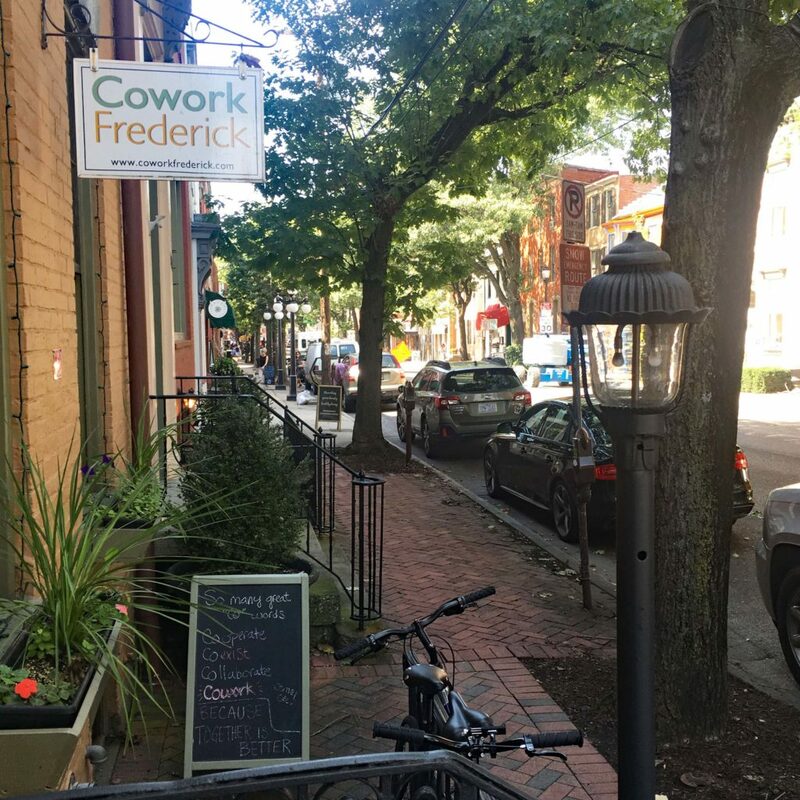 Cowork Frederick is filled with ambitious, creative, courageous people who have "hung their own shingle". They are pursuing their own business - their own dream. Glen and I did too, a little over six years ago, when we launched Cowork Frederick so that freelancers and entrepreneurs could do their own thing while sustained by a community of other freelancers and entrepreneurs. We recently started using the phrase “because together is better” and, for us, that phrase rings true. To hear why, directly from our members, check out a video they just helped us create.